Hi all, I am considering buying an old Mistral Maui 1988 for both light wind sailing and paddeling. It is 350 x 70 x 220L. I have a tabou rocket 145 that I have paddeled, but it does not track well, and is also pretty slow. This has been the worst year I can ever remember for wind since 1985. I think paddeling will be a good activity to keep in shape, but don't have the $ for new equipment. Anyone here doing this? that is using an old longboard for SUP? FWIW, "A guy at a swap meet" told me maybe 4 years ago that he had tried many SUPs but found the Mistral Superlight better than any of them. Most paddle boards average 30" wide, a little wider than a Superlight or Maui. Make sure you get a centerboard with the board, as centerboard down adds tons of stabilty for choppy waters or when starting out. Long tail fins also help with stability. I have a Protech that's is wide as a sidewalk which has been used to get 45+ people on the water SUP's for the first time. Here's my leftover shortboard that my son has got 3 seasons out of. The Mistral will definitely be fine for light wind sailing. SUPs may turn a bit better and be more stable for sail throw tricks, but an old longboard will be much nicer for touring (or if you want to get into rail riding ). You definitely want the centerboard for sailing. For paddling, I'm not sure the centerboard will help. I tried paddling my WindSUP10 with the daggerboard down one time, and found that it tracked worse (turned a lot more) than without the daggerboard. However, the Mistral is 2 feet longer and narrower, and should therefore track a lot better, so maybe it will paddle just fine with the centerboard down. I'm the original owner of a 1987 Mistral Maui which I still use for occasional light wind/non-planing summer sailing. It tracks very well under sail, with or without the daggerboard down. Till now, I never thought of using it as a SUP, but now I'm wondering. I don't think it would be good in the surf since it turns about as well as a cruise ship. If you get the Maui, please advise how it works as a SUP. 70cm is the width of many flat water Race SUP's, which tend to be much less stable. most recreational SUP's are 75-80 cm. A good fin will do wonders for tracking and a properly setup paddle and good technique will do wonders for stability. The skinnier the board, the more consistent forward motion matters. Have fun! 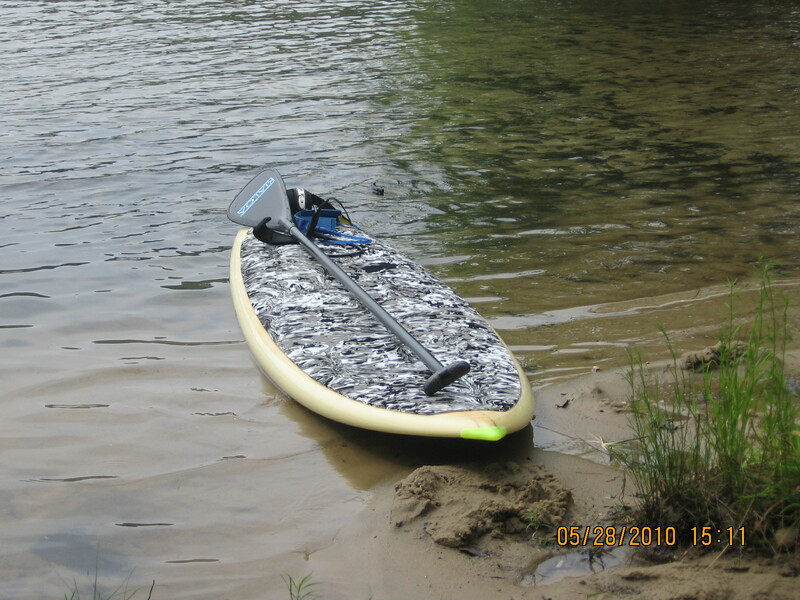 I've used the Mistral Maui for a SUP and like it with the centerboard down. My 9'6" x 69cm course slalom board was much more stable, with a 50 cm tail fin. My Protech 275 x 68 is a little squirrel for me. My Slab 285 x 72 is super stable with a 50 cm fin. Thanks everyone for your interest. I have decided to get the board, as it will also get me out on the water either sailing or paddeling. I love long distance cruising. I have not been getting out on the water enough, 5-10 times a year on average, sailing short boards only. I sold my Fanatic ultra cat in 1990, which was the board I sailed most of the time. I know the Maui is not a race board, but I think I will have a lot of fun with it. I can tie a paddle to the board when sailing just in case. When you think about it, you might not need to carry the paddle, but if you do, a half a kayak paddle in a backpack does the job. When the winds completely die to zero, and you can sail in 2mph winds easily, you need to derig. The top half of your mast is a great greenland paddle, as is the bottom half.